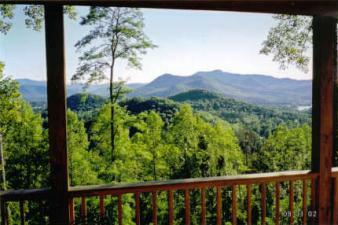 Home for sale on a private lot 1.13 acres in an upscale close-in development, Hidden Summit, Hiawassee, Georgia. Spectacular Lake and Mountain Views! Many Upgrades and Custom Features! 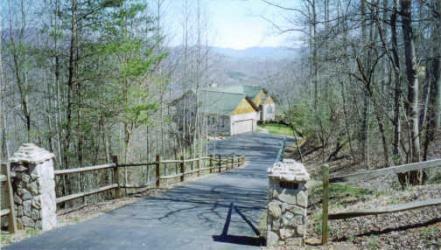 ~ Custom built in 2000 - Located on a private lot (1.13 acres) in an upscale close-in development. ~ Outstanding lake and mountain views - 3 minutes to marina and lake access. ~ Maintenance free exterior construction - Stone front walkway and foundation. ~ Vaulted great room and dining room, with breakfast area and spacious kitchen - all with hardwood floors. ~ 3 bedrooms, 2 baths, including walk-in closet and a master bath on main level. This level also features 9' ceilings, a large stone corner fireplace, and a spacious laundry room. High quality double hung windows throughout home. ~ Home has a media room, or room to be used as a roomy office. - Granite countertops in the kitchen. ~ Master bathroom features a corner whirlpool tub, a separate shower with a marble counter top and flooring. ~ Guest suite on separate level offers a private entrance, a living room and dining area, a bedroom with walk-in closet, large kitchen and spacious bathroom. ~ Unfinished daylight basement with 2 entrances and stubbed for plumbing. ~ Home has a 2 car garage with storage space on main level. ~ Large wrap around decks on 2 levels offering panoramic views. ~ High efficiency zoned gas heat and cooling system. ~ Gated paved driveways with plenty of parking. ~ Landscaping, stone columns, gate, and rustic fencing at entrance and around home. 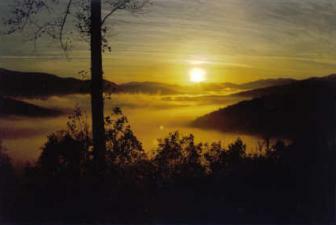 ~ Home served by paved roads, underground utilities, public water and cable TV.